Love Dream Stargaze: My Natural hair journey +"The need to change my hair!" itch. My Natural hair journey +"The need to change my hair!" itch. I have been wanting to change my own hair, so much. There is just a conflict between my hair goal and my want to change. Bleach has been calling my name. Bleached hair, framing my face, and eyebrows. 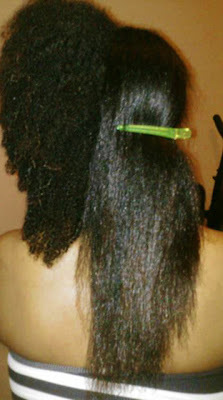 Unfortunately, I have already colored treated my hair years ago, after going natural. My hair would look awesome! Yet, would feel "bleh", and dry out so fast. It made it hard to retain length. I have grown out all the color, only the tips are color treated. Trying to keep strength until I reach mid-back or waist length, is hard. Once I reach my goal length, I can color and cut in bangs. Here is how far I have reached. I posted it on my tumblr a little while ago. I think I will post my wash, condition, and moisturizing routine later this week. Until then, enjoy the rest of your week! So lucky. I've been natural all my life and my hair will never be that long. It's healthy. But I want length. Have you tried protective styling for a few months?